Dr Jordan Nguyen’s mission in life is to improve the lives of as many people as possible and to be a driving force behind positive human and technological evolution into the future. He designs life-changing technologies focusing on intelligent, futuristic and inclusive technology for the disability sector. He believes the relationship between humanity and technology is constantly changing and its role in our lives is becoming more integrated, leading us to a future that is ‘Beyond Superhuman’. A passionate advocate for social change Jordan follows the mantra “One Life, Persist to Improve Many”; he believes each life has the capacity to improve many others fuelled by empathy, and that this simple idea can change the world. Jordan completed a PhD in Biomedical Engineering at the University of Technology, Sydney (UTS) in 2012, and was awarded into the prestigious UTS Chancellor’s List. For this Jordan drew on his own experience of having almost broken his own neck years before, so he developed a mind-controlled smart wheelchair for people with high-level physical disability. This smart wheelchair uses cameras to view its environment and provides autonomous navigation assistance to the operator whilst they control it purely by thought. This amazing work has led to Jordan being a hot topic of discussion in the media. He has been featured in a range of TV, radio, magazine and newspaper interviews, most notably ABC’s Catalyst and Channel TEN’s The Project. Jordan believes we must be proactive rather than reactive in the face of the rapidly changing landscape of the modern world, and believes that the more people understand the immense potential for technological developments in the near future the easier that becomes. One way he has applied this thinking is through founding Psykinetic, a social business that creates futuristic empowering and inclusive technologies to improve quality of life for people with disability, and beyond. Another way he achieves this is through his inspirational communication ability. Jordan has keynoted at prestigious events such as Think Inc. and Wired for Wonder, among many others. He has shared the stage with a number of influential people, including Nolan Bushnell, founder of Atari. As a speaker Jordan has the ability to translate highly technical concepts and future trends into clear and concise content, relevant to any organisation looking to proactively embrace and adapt to technological change. He has on several occasions presented internationally at the world’s largest annual biomedical conference, the Engineering for Medicine and Biology Conference (EMBC), on advances in intelligent assistive robotics and controlling technology with the power of the mind. Jordan has been on the board of directors for Object: The Australian Design Centre, is a member of the board for the NSW Medical Technology Knowledge Hub, and taught project development in Artificial Intelligence design and Biomedical Instrumentation for engineering masters students at UTS. He has more recently worked on his first TV documentary for the ABC (during the Catalyst timeslot) called ‘Becoming Superhuman’ set to air 24th and 31st May 2016 and is currently writing further series and documentaries. 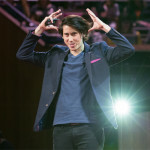 Dr Jordan Nguyen is a leader many look to for inspiring others on the future of technology for humanity, purpose and where our futures are headed, with a core focus on driving positive global impact.